These were the seminal books in the childhood of many a NASA engineer and astronaut. Especially those books illustrated by Chesley Bonestell and based on Wernher von Braun's designs. They portrayed a "traveler's guide" to sights that no one had seen yet but would be right around the corner. The theme in these books over and over is: It is possible if we just work hard enough. 1950. Fenton, Carroll Lane. Illustrated by M.A. Fenton. Worlds in the Sky . 1950. Smith, Jeanette. Sun, Moon and Stars . 1951. Townsend, Herburt. Illustrated by Herburt Townsend. Our Wonderful Earth. .
1951. Pratt, Fletcher. Illustrated by Coggins, Jack. Rockets, Jets, Guided Missiles and Space Ships . 1951. Illustrated by Bill Lacey. The Young Adventurer's Pocket Book of Space Travel . 1952. The Book of Model Space Ships . 1952. Pratt, Fletcher. Illustrated by Coggins, Jack. By Spaceship to the Moon . 1952. Flights Into the Future. 1952. French, Susan (ed.) Illustrated by R.A. Smith and others. Daily Mail Annual for Boys and Girls. .
1952. Gifford, Denis. Illustrated by Gifford, Denis. Space Patrol Official Handbook . 1952. Goodwin, Hal. Illustrated by Clifford Geary. The Real Book about Space Travel (book jacket). 1952. Neurath, Marie. Rockets and Jets . 1952. Randolph, Rheta. Illustrated by Jacque Stain. Space, Time and Rockets . 1952. Kaplan, Joseph, Wernher von Braun, Heinz Haber, Willy Ley, Oscar Schachter, and Fred L. Whipple. Edited by Cornelius Ryan. Illustrated by Chesley Bonestell, Fred Freeman, and Rolf Klep. Across the Space Frontier (book jacket). 1952. Major Jet's Magic Paint Set . 1952. Reichert, E.C. Illustrated by A.K. Bilder. Space Ship to the Moon . 1953. Barlowe, Sy. A Child's Book of Stars . 1953. Bendick, Jeanne. The First Book of Space Travel . 1953. Dan Dare's Space Book . 1953. Discount, William Alan. The Complete How-To Book of Space . 1953. Editors of CHILD LIFE. The Busy Bee Space Book . 1953. Frost, Francis. Pictures by Paul Galdone. Rocket Away! . 1953. Hollinson, Harry. Illustrated by Leslie Butler and Cecil Bayly. Rockets and Space Ships . 1953. Hust, Earl Oliver. The Big Book of Space . 1953. Hyde, Margaret O. Illustrated by Clifford Geary. Flight: Today and Tomorrow . 1953. Laurie's Space Annual . 1953. 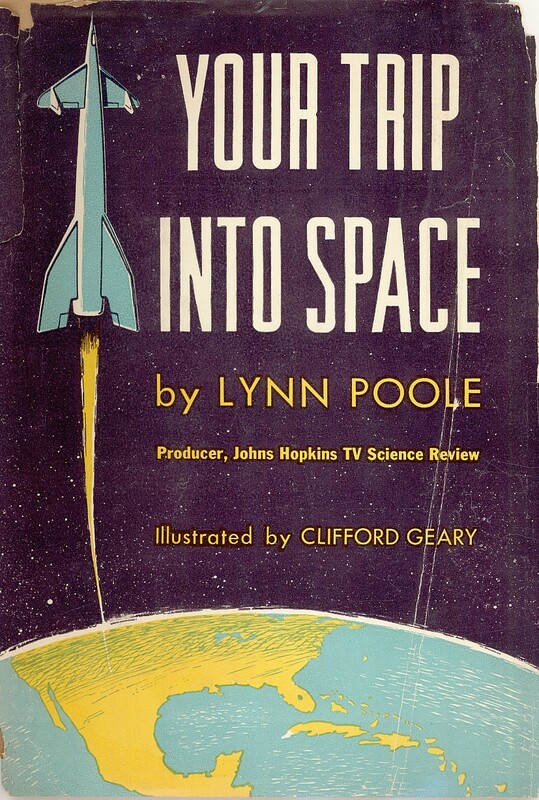 Poole, Lynn. Illustrated by Geary, Clifford. Your Trip into Space . 1953. Richfield Oil Corporation. Outer Space . 1953. Thompson, Jeff. Out of This World: An Activity Book Based on Space Travel . 1953. von Braun, Wernher, Fred L. Whipple, and Willy Ley. Edited by Cornelius Ryan. Illustrated by Chesley Bonestell, Fred Freeman, and Rolf Klep. Conquest of the Moon .